Von Balthazar, Troy, "...is with the demon"
With his new album, The Hawaiian born Troy Von Balthazar chooses to devote himself body and soul to music. The frontman for the cult band Chokebore once again creates a melodic atmosphere completely intense and always interesting. 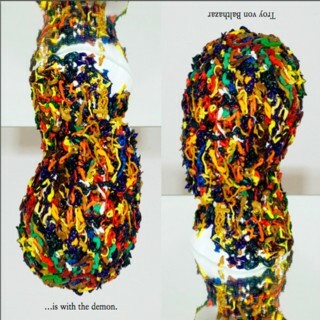 After spending the last 6 years moving between European cities writing "...is with the demon", his newest full-length album carries him home, across the Atlantic waters back to the states. Like an invigorating breath, this new material comes forth with great ease and natural power, beaming with matured infancy. It captures a wonderful look at the artist's new palette, strokes of effortlessness in the vein of Sparklehorse and John Frusciante. Troy Von Balthazar ...is with the demon.